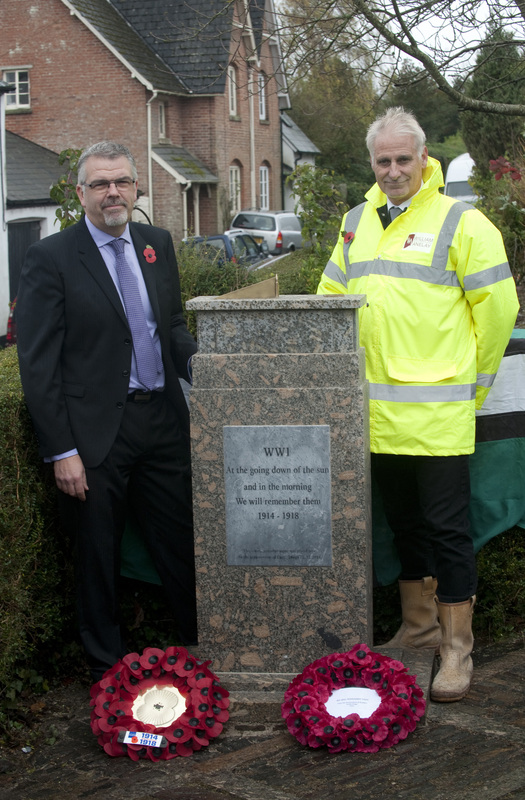 On Tuesday 11th November, a First World War commemorative stone sundial was unveiled in Drewsteignton Village Garden to mark Remembrance Day. Tim Cambourne, Castle Drogo Project Manager said: ‘There is a very close connection between the Trust and the residents of Drewsteignton and surrounding villages. Many of the craftsmen working on the castle enlisted along with Julius Drewe’s three sons. ‘Like many of the men, the heir to Castle Drogo died at war and building work was curtailed and the Castle not completed until 1930, the walls of which are said to be memorials to its lost community of craftsmen. ‘It is for these reasons that we offered to provide this memorial, created by the craftsmen currently working on the Castle , to the parish as a gift from the National Trust and our contractors currently working on restoring the property’, he added. 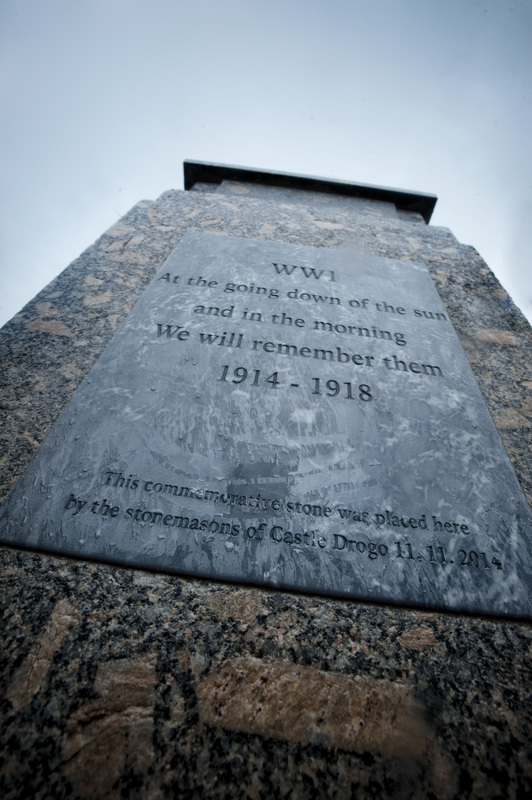 Bill Savage, Chairman of Drewsteignton Parish Council said: ‘Castle Drogo and the Drewe family have played an important part in the parish of Drewsteignton for 100 years. When the castle was being constructed many of the workers from this and neighbouring parishes left to fight in the First World War. A century later we find major renovation works being undertaken by the National Trust at the castle and the Parish Council were thrilled when the Trust & their contactors, William Anelay Ltd, approached us offering to erect a commemorative stone to the war in the parish. Negotiations between the Council & Tim Cambourne, Senior Project Manager with the National Trust, have resulted in this wonderful monument in the village garden at Drewsteignton. Edwin Lutyens who was commissioned by Julius Drewe to design the castle and grounds, also designed the Thiepval memorial and Cenotaph memorials. His contribution links local, national and international memory. You may have noticed that some of the clocks in the Room of Time Passing have decided to cease working. Others are striking on the hour but not always in accordance with the time shown on the face: I’ll leave you to work out the miscreants but, a clue; it is not the long case clock. The Horologist will be coming in over the closed season to instruct/assist when the clocks are removed from this room and when the clocks are in their new position hopefully he will be able to start them working again and sort out the incorrect striking. You may ask why not bring him in now, but at a cost in excess of £300 per day, Lucinda has to limit the time he is here. It is generally accepted that clocks dislike being moved and previously accurate clocks frequently refuse to keep time or even work. 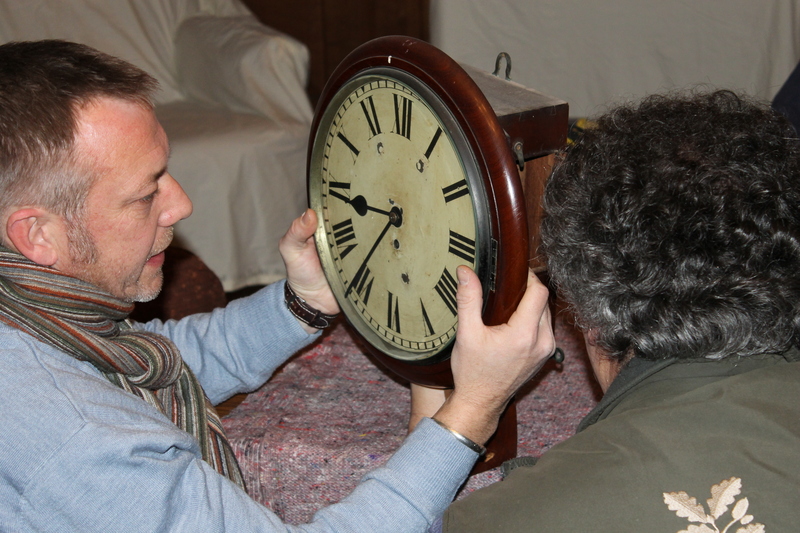 The French Striking Mantle Clock which was in the drawing room is determined not to work. The Brass Mantle Clock from the bedroom, the small arched wooden Mantle Clock from the Man Servant’s Room and the Mantle Clock from the Work Room are all very temperamental, one week they simply stop, the next one they perform as they used to. The three wall clocks have all had weeks when they keep time and then weeks when they refuse to work. It is essential that they are perfectly vertical and when wound on the panelling in the Room of Time Passing they tend to slide out of the vertical. The Mantle Clock from the Rayners’ Room has been the star performer and seems to be perfectly happy in its temporary position.The French Marble Mantle Clock has been returned to Adrian’s Room and is performing as before. 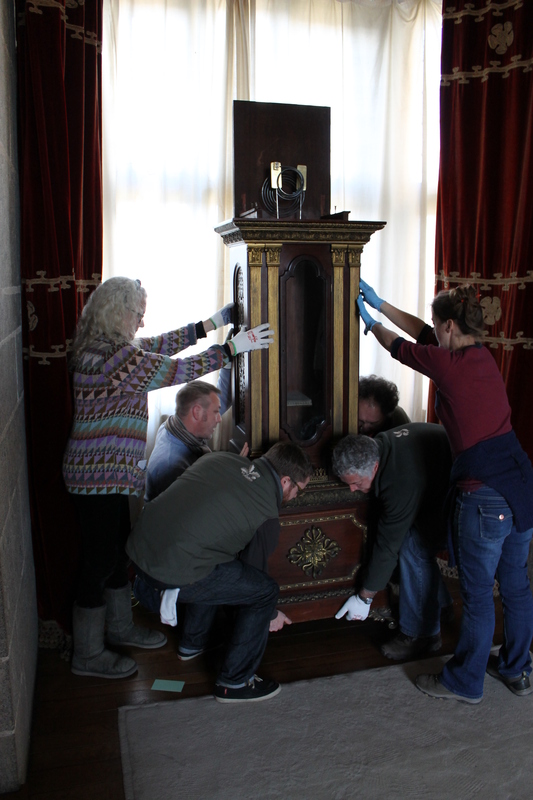 After a shaky start to the season the Long Case clock is now back to its best and keeping very accurate time. The clock was made by John Smith and Sons of Clerkenwell in London in the late 1890s and exhibited in Paris in 1900. This firm started in 1780 and are still trading today although no longer producing clocks. They are into the supply of non- ferrous metals and are one of the leading suppliers of clocking making brass. The turret clock was erected at Wadhurst. All four faces were in use and it was backlit with oil lamps on high days and holidays. The clock was manufactured by Gillett and Johnston of Croydon in 1905. It is a five day clock and is wound twice a week. The plan at Castle Drogo was to incorporate the turret clock onto an arch over the entrance to the stable yard but it did not come to fruition and instead only one face was incorporated into the dormer over the entrance door to the Gardeners’ bothy. The bell we believe was also made by Gillett and Johnston but it appears it was cast in 1929. It has a serial no 2192. It is not known if there was a bell at Wadhurst but it seems this bell was specifically made for Castle Drogo. Gillett and Johnston were founded in 1844 and are still trading today. They started a bell foundry to complement their business in the 1880s although they sold this side of the business in 1958.During the First World War their factory in Croydon was involved with the manufacture of munitions. Amongst their commissions over time are clocks at Eton College, Hampton Court Palace, Kensington Palace, Windsor Castle, Exeter Cathedral and Bath Abbey. They have also been involved with Automaton Clocks at Libertys of London and Wells Cathedral, and advertising/publicity clocks for among others Asda, Tesco and Waitrose. A more recent commission was for a clock on the Sandringham Estate. The business has recently developed another line specialising in the refurbishment and redecoration of Coats of Arms.